The stern-faced poster of Uncle Sam, finger pointing at the viewer, demanding “I Want You,” is one hundred years old this year. Showing no signs of decrepitude nor any desire for quiet retirement, today the icon remains as recognizable and remixed as ever. Uncle Sam’s demands have changed during his long life on paper, and, increasingly, in pixel, but he has endured. 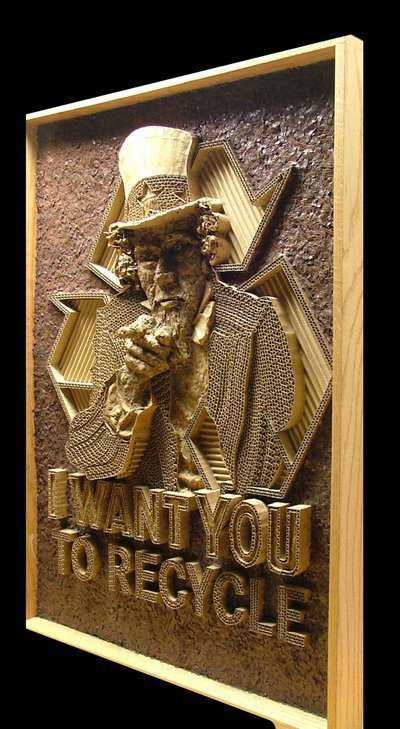 After a century, “I Want You” is arguably still the single most famous image in American history. When Flagg sat down to draw him, Uncle Sam already existed as an easily identifiable figure in American visual culture. He had first appeared as a cartoon and national personification in the 1830s. He truly came into his own in the second half of the nineteenth century, however, in the age of the great illustrated weeklies — like Puck and Harper’s — and through the work of prolific cartoonist Thomas Nast (who was also responsible for the look of the first modern American Santa Claus, and for the Republican Party’s elephant). By 1916, Uncle Sam would already have been recognizable to most Americans as a lanky symbol with white hair and a goatee, wearing a tall hat, striped red and white trousers, and a long blue tailcoat. Flagg later claimed that he had wanted to create a “new type,” a more modern American uncle. “I didn’t like the circusy Uncle Sam with stars all over him,” Flagg wrote in his 1946 memoir Roses and Buckshot. He set out to paint “a handsome, dignified figure” instead. In his studio in New York City, Flagg added his own — very personal — touches. He used a mirror to finish the illustration, and drew Uncle Sam’s famous details — piercing blue eyes, handsome lips, shaggy grandfatherly eyebrows — from his own face. Although Flagg was clean shaven, he kept Uncle Sam’s distinctive facial hair. His Sam’s dress was similar to, but less flamboyant than his ancestors’: blue coat, white shirt, red bow tie. There were no stripes, and only a single tasteful row of stars trimmed the hat. When the United States joined the war in April 1917, Flagg’s Uncle Sam was immediately mobilized. 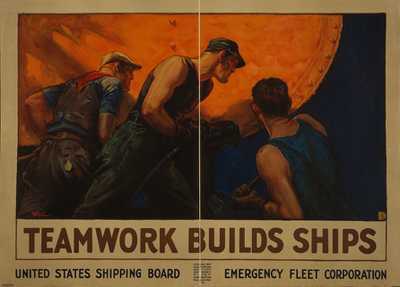 The illustrator transferred the copyright to the U.S. Government, the text was changed to “I Want You,” and a record-breaking four million recruitment posters were rushed off the nation’s color lithographic presses. The image has worked — and continues to work — for all kinds of admonitions and desires. 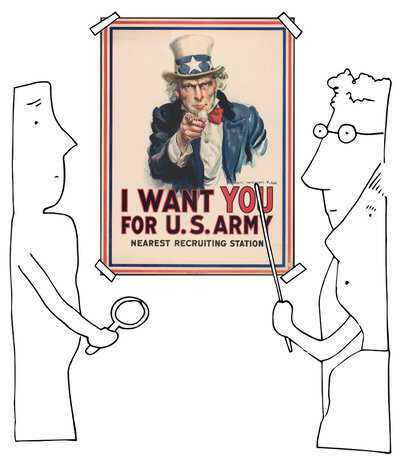 Since 1917, Uncle Sam has wanted you for the Second World War. He has wanted you to support Franklin D. Roosevelt’s presidency (“I Want You F.D.R. / Stay and Finish the Job”). He has shape shifted from spokesman for the state to voice of protest. During the Vietnam War, bandaged and bleeding, he wanted out. Another Vietnam poster suggested that Uncle Sam’s true face was that of Death: behind the torn image of the flesh and blood uncle was a beckoning skeleton; it still said “I Want You for the U.S. Army,” but the words read differently. Uncle Sam is now enjoying a vigorous second life in the digital era, the age of the remix. He’s shed his skin hundreds more times, but his posture, gaze, and pointing right index finger have remained. So has the way he delivers the message — whatever that may be. He wants you for all manner of fictional armies, rebels and Galactic Empire alike. As David “Big Papi” Ortiz, he wants you to support the Red Sox. 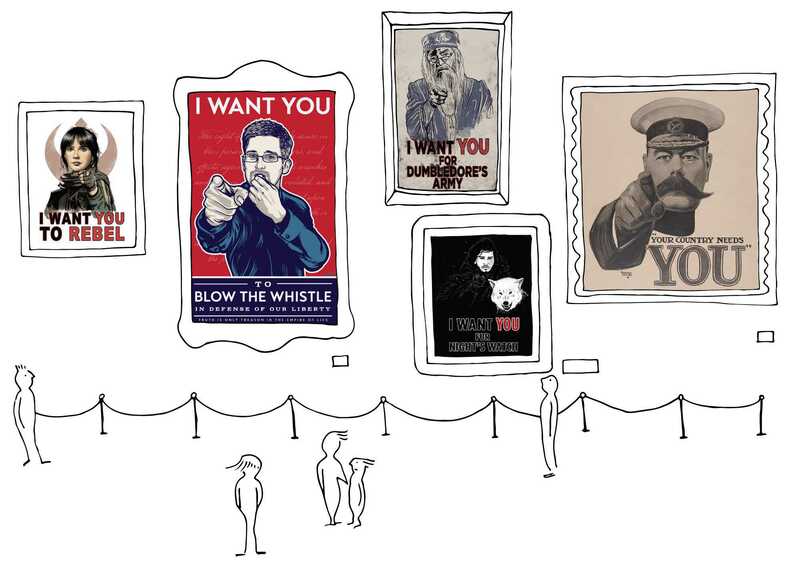 In a design by Dan McCall for a WikiLeaks fundraiser, as Edward Snowden he wants you to whistle-blow. We often think of remix culture as a uniquely modern phenomenon, so it is surprising that Flagg’s “I Want You” was already a remix when it was first created a hundred years ago. The original Uncle Sam was in fact a re-imagination and Americanization of a British recruitment poster created by Alfred Leete in 1914. 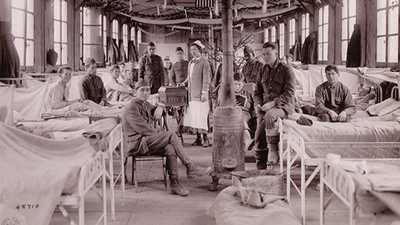 In WWI more than 10,000 nurses served near the Western Front, many at front-line medical stations. But they served without rank or commission. 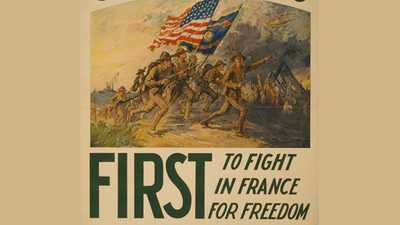 The Battle of Belleau Wood in 1918 has since achieved near mythic status in U.S. military history, particularly for the U.S. Marines. How George Creel sold the Great War to America, and America to the world.